Negotiations on a downtown one acre parcel of land owned by Academy Bus is reaching a public conflict stage as it's sought for purchase by the City of Hoboken. That's the assessment of many after the business publicized its position with a major ad in the weekend paper. The approximately one acre parcel sits adjacent to another one acre already being developed by the City for a southwest park. That property was obtained by the City in an eminent domain purchase. 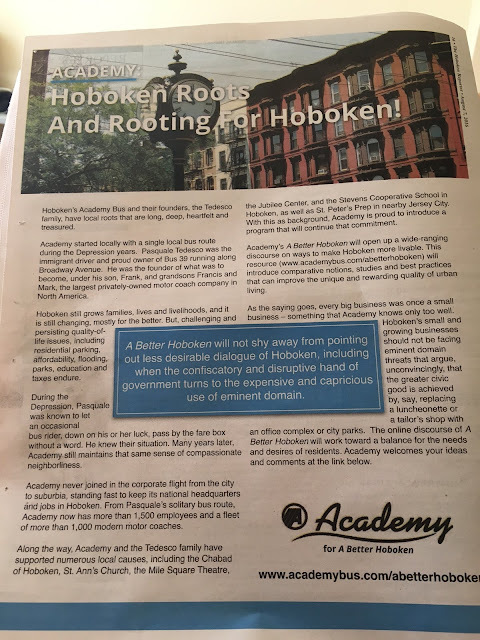 Academy Bus, after months of negotiations is gearing up in a public effort to push back on any potential eminent domain action by the City of Hoboken. 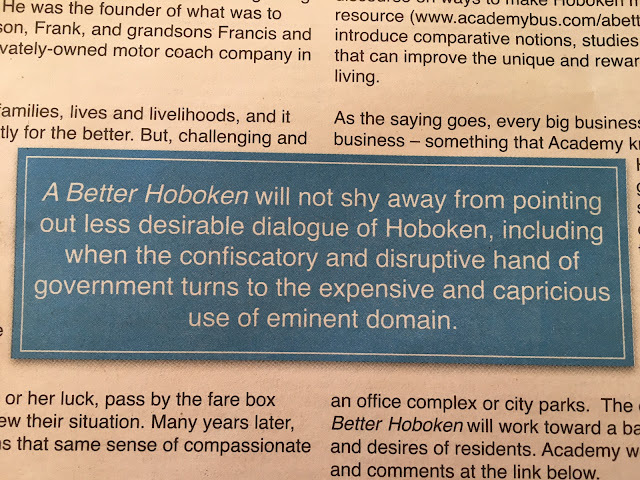 The outtake from the ad pointedly speaks against any such action calling it "less desirable" and concluding: "... when the confiscatory and disruptive hand of government turns to the expensive and capricious use of eminent domain." Hoboken's Mayor Dawn Zimmer was unavailable for comment about the ad and is reportedly out of town with her family on vacation. Another effort to obtain land uptown on the west side appears less contentious. An almost six acre parcel on the west side of Hoboken owned by BASF has been the subject of discussion and City Council closed session discussions for many months. The public is not party to the private negotiations thought ongoing. Last month, an NJ.com story puts the difference in how the City and Academy Bus value the one acre parcel at approximately $9 million apart. The City of Hoboken values it at $4-5 million and Academy Bus estimates its value at $13 million. The Hoboken City Council must approve an eminent domain action. The southwest park eminent domain vote narrowly passed in a contentious 5-4 vote back in June 2012. Talking Ed Note: It doesn't appear the BASF negotiations are as contentious as the one acre downtown owned by Academy Bus. Hoboken has a vision for a multiple acre downtown southwest park. Related: The City Council passed a resolution to move on a January concept plan to improve traffic entering Hoboken on lower Jackson St. the same location where the southwest park is undergoing construction. That low cost idea put forward by Councilman Ruben Ramos and has languished for months as the City said a study was required. The succeeding study has not dissuaded the City Council from finally moving ahead. It voted 6-2 Wednesday night approving a pilot plan to remove parking on the initial block intersecting with Observer Highway during rush hour.